Our strong inpatient and ambulatory program emphasize the central importance of education in all of our clinical activities, both at Georgetown and at our affiliated institutions. During the three years, the resident will encounter the entire range of acute and chronic illness seen in the community, the inner city, as well as the tertiary referral center. You will also encounter a program with a unique focus and commitment to continuity education for your future practice. Daily management rounds are conducted by the team senior resident in conjunction with the attending hospitalist, and are geographic in nature, greatly improving communication with our multidisciplinary team of nurses, social workers, case managers, and pharmacists. In addition, teams will meet with a designated “teaching attending” with a specific focus on education of our students and residents. The Chairman, Program Director, and other faculty members participate in daily morning report regarding recent admissions along with follow-up on cases discussed earlier. The admitting resident, assisted by the Chief Residents, General Medicine and Subspecialty faculty, guides the case discussion and its implications. In addition to traditional case review, clinical problem solving, High Value Care, pain management, and ethical implications of cases are discussed. At the start of each morning report, a brief “morning unknown,” based upon MKSAP questions, is reviewed by the Chief Resident in conjunction with the participating house staff. Hospitals available for inpatient and ambulatory rotations include Georgetown University Hospital (GUH), the National Institutes of Health, the Veterans Affairs Medical Center, the Washington Hospital Center and other affiliated community hospitals. Resident requests are honored when possible based on a “wish list;” schedules increase in flexibility during the second and third years of the program. With advance planning, time is available for research blocks as well as away electives (including abroad). Residents may rotate at one or more of our community hospital affiliates. Interns principally remain at Georgetown and the VAMC. Please see Affiliated Hospitals page for additional information. There is a full night float team at Georgetown, in order to relieve the call teams, so the resident and intern on call take their last admission at 7:30 p.m. and do not stay in-house. The night float team takes admissions and cares for inpatients overnight, then returns care responsibility to the primary team the next morning. All residents and interns are guaranteed one day off each week (typically on weekends) on average while on inpatient services. Our new “Block” schedule also increases the number of “golden weekends” during ambulatory rotations and elective time. Residents on elective have weekends off and no night call, although they may be responsible for float coverage once or twice during the month. Ample vacation time is divided into two separate blocks totaling four weeks each year, plus one week off for every resident during the Christmas / New Years time frame. In addition, all categorical interns have a 10-day break between their PGY-1 and PGY-2 year. Residents on elective provide coverage in the event of illness or emergency. 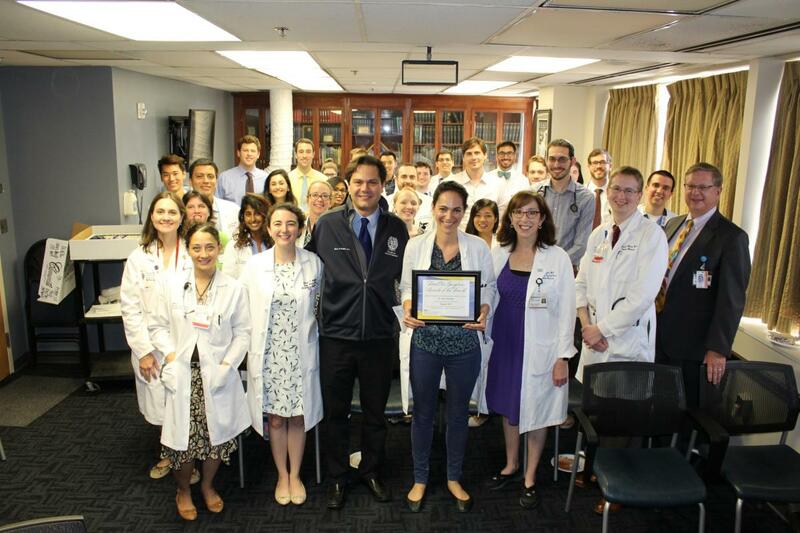 This experience at Georgetown has traditionally been an area of strength in the residency program. Georgetown University Hospital provides exposure to the latest in sophisticated intervention and monitoring with patients referred locally and from around the world. On the Cardiology elective, daily rounds by Cardiology attendings focus on bedside evaluation, perioperative cardiac evaluation and risk stratification, interpretation of data, and management of common cardiac disorders as well as the latest in diagnostic and therapeutic modalities. The GUH Medical Intensive Care Unit experience includes management of the full range of life-threatening medical illness. There is an active ventilator service, with daily rounds by Critical Care attendings at the University and at all affiliate programs. Patient volume is consistent, and the diversity of illness seen is assured by an active air transport referral service from throughout the surrounding region. MICU and CCU rotations at affiliated hospitals round out the overall critical care experience. Interns and residents rotate through the CCU, heart failure and Cardiology services at Washington Hospital Center, offering the busiest cardiac catheterization lab in the nation. CCU rotations at Inova Fairfax been a mainstay of the program as well. ICU experiences require every fourth night call. The numbers of admissions vary with location.